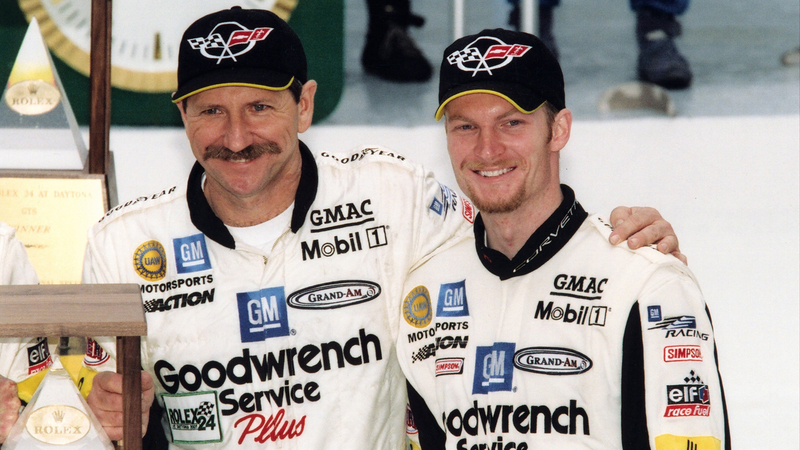 The 2001 Rolex 24 at Daytona was a magic racing moment for Dale Earnhardt and son Dale Earnhardt Jr., who split time driving the No. 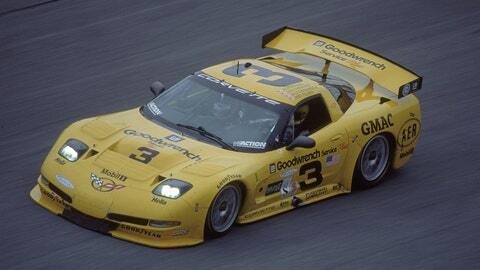 3 Corvette C5-R with Andy Pilgrim and Kelly Collins. Despite heavy rain for much of the race and a lack of familiarity with the fast, lightweight Corvettes, the Earnhardts more than held up their end of the bargain, as the team finished fourth overall in the 79-car field and second in the highly competitive GTS class. All weekend long, the elder Earnhardt was a sponge for information. 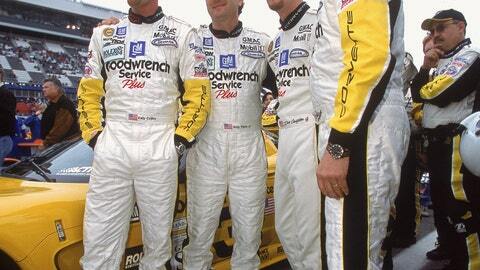 While he was a seven-time NASCAR Sprint Cup champion, Earnhardt was a novice with the Corvette. "Keep an eye on my times," Earnhardt said to his teammates over the radio during his first three-hour shift in heavy rains. "If I’m going too slow, call me in and put Andy back in." "You’re doing fine," Pilgrim responded. Pilgrim was impressed by Earnhardt’s driving. "I just told him where and what to expect on some of the course’s most treacherous spots," Pilgrim said. "He listened, he asked questions. Dale did a phenomenal job." And once he ran his first race in the Corvette, Earnhardt was hooked. "When we left that day after the Rolex 24, we hadn’t even gotten in the air when Big E already started making plans for the next one," said Steve Crisp, then Earnhardt’s right-hand man. "In all the years I’d known him, Big E was one of the baddest guys in the jungle when we walked into any other place," said Crisp. "Yet, when we went to the Rolex 24 he understood he wasn’t coming in as the 800-pound gorilla. "Dale had a huge amount of respect for drivers who could jump back and forth from one kind of race car to another and it’s something he wanted to do, too. It was a challenge to him. He wanted to learn and he asked Andy and Kelly and all of them a ton of questions. He was like a kid in a candy store. I wasn’t expecting that at all but it was pretty cool – especially looking back on it." In fact, Earnhardt was so fired up that he started talking about entering the 24 Hours of Le Mans in a Dale Earnhardt Inc. car. Sadly, of course, he never got the chance, perishing two weeks after the Rolex 24 in a last-lap crash at the Daytona 500. Still, given Earnhardt’s talent and drive, you have to wonder what might have been. FOX Sports will have 15 hours of live network coverage from the 52nd running of the Rolex 24 at Daytona. Prerace coverage begins Saturday at 1:30 p.m. ET on FOX Sports 2. Race coverage begins at 2 p.m. ET on your local FOX channel. Dale Earnhardt speeds down the track during the Rolex 24 Hours of Daytona at Daytona International Speedway. Dale Earnhardt, Dale Earnhardt Jr., Andy Pilgrim and Kelly Collins stand by during the Rolex 24 Hours of Daytona at Daytona International Speedway.